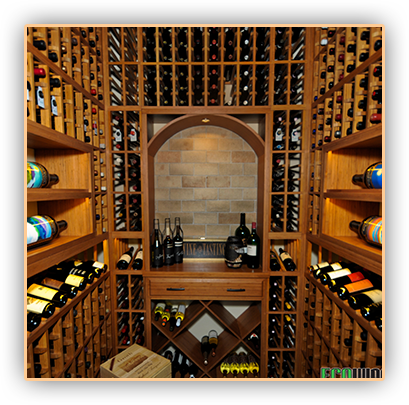 We at Custom Wine Cellars Chicago are experts on the process of wine cellar installation and construction. With over 20 years of experience in wine cellar design, wine storage and wine display industries, the designers at Wine Cellar Installers Chicago Illinois have an extensive understanding and knowledge of all of the technical aspects of wine cellar construction and design. Custom Wine Cellars Chicago works very closely with our clients, on an individual basis, to meet the unique needs of each individual, guide them to explore the different products and possibilities available, and help them decide what the best options are for their specific wine collection and wine storage environment. The expert wine cellar installers and designers at Custom Wine Cellars Chicago understand the importance of protecting and preserving the well-being of your wine collection. Wine is one of those rare commodities that develops exquisitely under the optimal conditions, but can just as easily deteriorate when stored under adverse conditions. Wine Cellar Construction – What are the Factors We Consider? Location, temperature, humidity, size of the collection, wood species and budget are some of the factors to consider in wine cellar construction. These factors will help wine cellar installers and designers develop the right display and storage solution that will suit best your storage space and wine collection. Custom Wine Cellars Chicago provides clients with their own consultant that will assist them throughout the entire phase of the project, from conceptual design to actual wine cellar construction. We offer phone consultation and a 3D drawing of the proposed wine cellar design with a complete quote, completely free of charge. Preparing a wine cellar 3D illustration for our clients allows them to visualize the finished product as well as make design adjustments and modifications before wine cellar construction and installation takes place. Our free 3D wine cellar design drawing package includes an overhead view of the plan, elevations, and several three dimensional visuals. What Wine Storage Products Do We Offer? 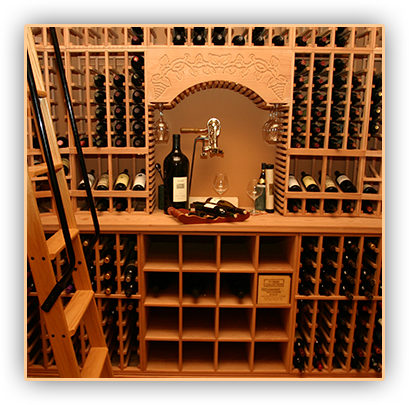 As a full service company, our wine cellar installers Chicago Illinois offer a full line of high quality wine racking systems in custom and modular formats, wine cellar refrigeration systems, wine cellar doors, and flooring products. We also provide a line of handcrafted wood products designed and created by third generation wood carvers. Our custom wine racks are designed and manufactured to fit the unique structure of each wine cellar space, while our modular wine rack kits are available in several pre-fabricated configurations and models. 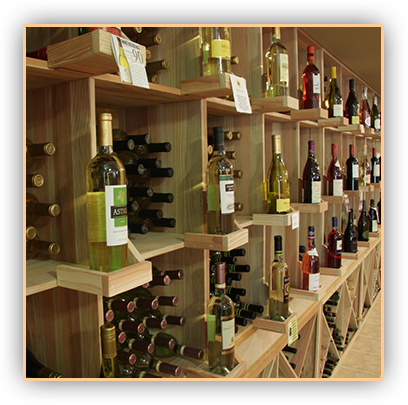 We offer a wide array of wine rack styles to suit your display needs and design preference. At Custom Wine Cellar Installers Chicago Illinois, we offer a full line of refrigeration systems to help maintain the ideal storage environment for storing and aging wines. We provide self-contained or through the wall units, ducted self-contained units, and split systems. Click here to view the different types of wine cellar cooling units. 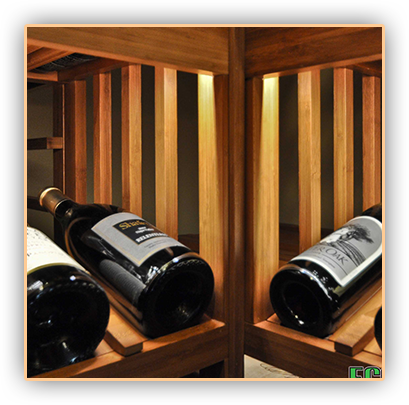 The custom wine cellar doors that we offer are available in a variety of wood species, such as Knotty Alder, Clear Alder, Walnut, Douglas Fir and African Mahogany. All of our doors are LVL engineered with mortise and tennon corners. We offer an eco-friendly flooring option in reclaimed wine barrel flooring and cork flooring. Reclaimed wine barrels create beautiful and distinct flooring for your custom wine room, while cork flooring provides a cushiony soft and comfortable wine cellar surface for you to tread on. Whether it is a small room conversion or a full wine cellar installation, we at Custom Wine Cellar Installers Chicago Illinois can help bring your wine cellar dreams to life. Our office is located at 858 W Armitage Ave #385 Chicago, IL 60614. You can also check out our website to view some of our completed wine cellar projects.